One of the most common misconceptions about nutrition is that it is something that affects merely the content of your plate, when, in fact, it is a life-changing choice. What a lot of people don’t understand is just how the connection between our natural stimuli goes. In fact, you can manipulate your interior design and space in order to become more focused, more alert and even gain or lose weight at your own behest. That being said, here are several biophilic design tips that will help you decorate your space as only a professional nutritionist could. One of the first things you need to understand is that colors have a way to affect our dietary habits. For instance, colors like brown, black and grey tend to diminish our appetite, same as blue and purple. On the other hand, colors red, green and yellow tend to make us hungrier. Needless to say, this is one of the interior design methods one could use to improve their own eating habits. Most importantly, we associate certain foods with their colors. As you could notice from the previous paragraph, colors of food are usually ones that compel us to eat the most. Therefore, by decorating the walls of your dining room with floral and plant motives, as well as displaying pot plants everywhere, you can significantly strengthen your craving for salads and other herb-based foods. In this way, you can use your design to encourage a fiber-rich diet and, in this way, have your health benefit, as well. Another thing you need to keep in mind is that an exposure to the natural light brings numerous health benefits for both your physical and mental health. According to numerous studies, UVB rays we get from exposure to natural light causes a production of vitamin D. As it goes, vitamin D is vital to our cell regeneration, apart from it being one of the greatest contributors to the immune system. Of course, the levels of vitamin D that you acquire in this way can’t completely replace those introduced through a proper nutrition or supplementation, nonetheless, every bit helps. The next thing you need to keep in mind is the fact that through biophilic design, you get to appeal to your other senses, as well. For instance, an indoor garden needs its own irrigation system, in a smart office, this would also include features such as water timer and an automated sprinkler system. The very sound of water has a calming effect on a lot of people and tuning in on a YouTube channel in order to play it will never be as effective as the real thing. 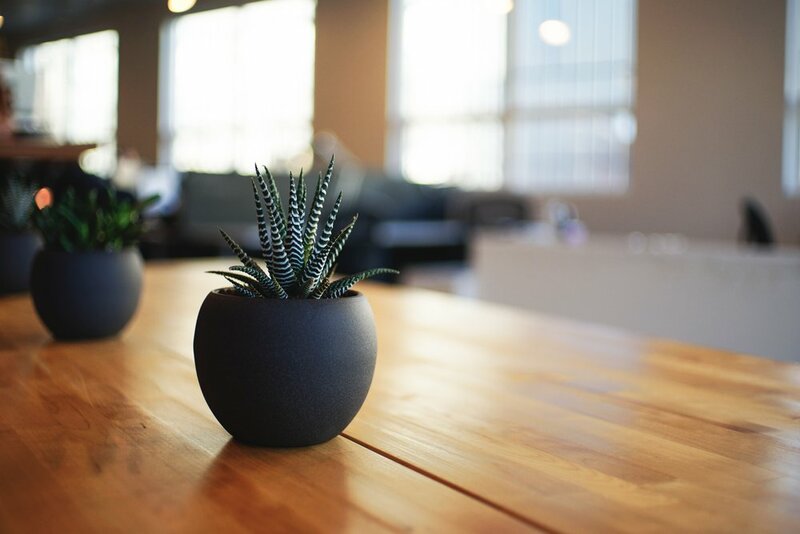 Apart from this, outfitting your office with numerous houseplants will improve the overall air quality in the room, which benefits your entire organism, including your digestive system. Last, but in no way least important, you will get the benefit of working in an environment filled with stimulating natural scents. The last thing that a biophilic design can achieve may seem like something a bit contradictory. You see, you get to create a privacy in an open space. The surrounding of your desk will seem more fitting for a park than an office, which can be a great aid for those who are a bit claustrophobic. On the other hand, you are still in an indoor, sheltered environment. The irony is that both of these aspects boost your productivity, the only problem being the fact that it is incredibly hard to make them work side by side. With a biophilic design, this shouldn’t be an issue. At the end of the day, both nutritionist and biophilic designer have the same goal in mind – greater mental and physical health of all the inhabitants. Through various stimulus, both of these worldviews can work together to create an optimal work environment that will bring numerous benefits in the long run. Apart from this, you also have the privilege of knowing that you are designing something new and completely unique. In fact, you can turn your office’s design into one of your company’s strongest corporate values. Possibilities behind this are endless. The above is a guest post by Lena Hemsworth: aside from her primary area of interest and expertise in blogging, Lena could be tagged also as a passionate traveler, nature and photography enthusiast, always trying to keep up to date with the latest trends in design and architecture.